TLV Euro Engineering is offering a steam trap survey that will help to maximise the performance of steam process plants. 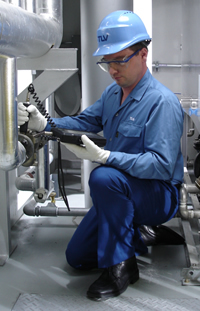 The company claims that each leaking steam trap could be losing up to GBP2,000 per year, so the survey, using its computerised Trapman® steam trap inspection system, is suitable for any facility using process steam. At the heart of the Trapman® system is data from TLV's own laboratory bench tests of more than 3,000 different makes and models of steam traps (including its own range), which means that Trapman® can be used to inspect and monitor any steam trap. The system, which features the handheld TM5 diagnostic instrument and specialised Trapmanager software, compares ultrasonic and temperature readings with known laboratory data to determine whether a steam trap is operating normally or not. If it has failed, the system can determine the amount of steam lost through leakage. 'Faulty or incorrectly installed steam traps can reduce production efficiency, adversely affect product quality, increase maintenance costs and prevent compliance with environmental standards.